For the Game Boy game, see Mega Man V.
Mega Man 5, known as Rockman 5 Blues no Wana!? (ロックマン5 ブルースの罠! ?, Rokkuman Faibu Buruusu no Wana!? ?, lit. "Rockman 5 Blues' Trap!?") 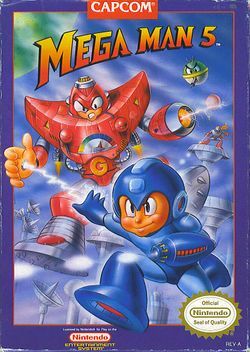 in Japan, is the fifth Mega Man game in the series. It marks the first appearance of a robot bird named Beat. This page was last edited on 28 February 2016, at 17:48.